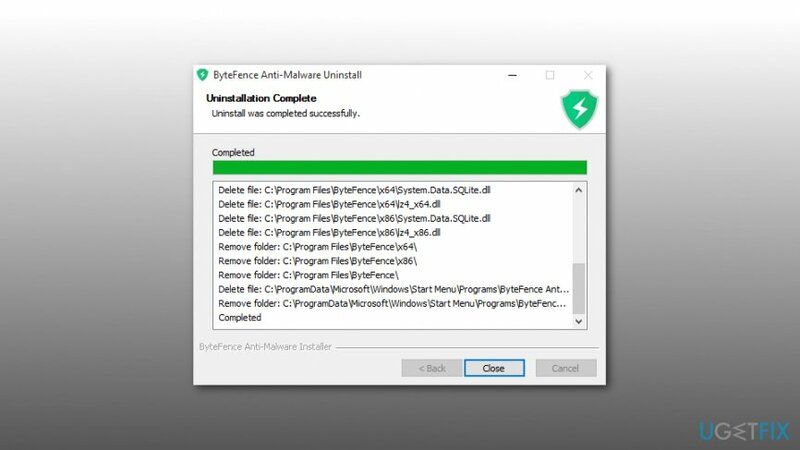 Home »	Uninstall » How to Uninstall ByteFence Anti-Malware from Windows? Issue: How to Uninstall ByteFence Anti-Malware from Windows? I think that Java update installed ByteFence on my PC. The problem that I can’t uninstall it using Add/Remove programs feature. Could you please guys help? 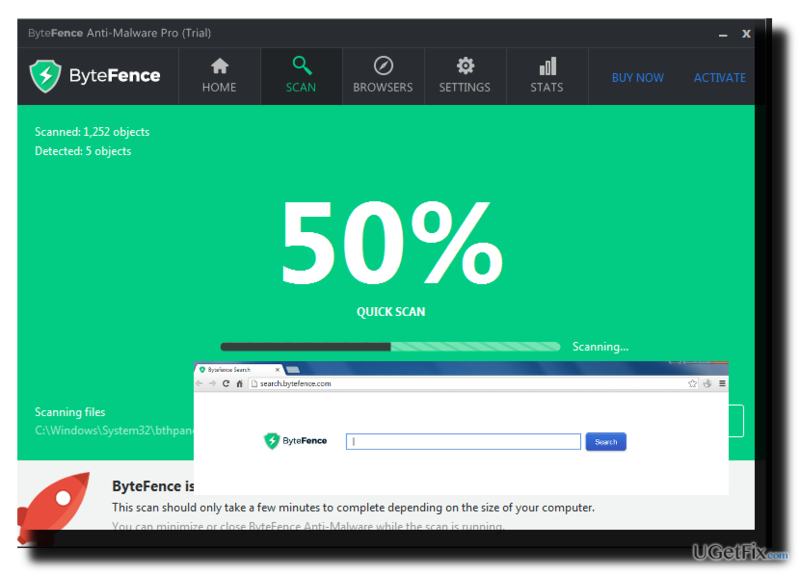 ByteFence is a security program that protects Windows computers from malware, spyware, and crapware. The anti-malware program has free and paid versions that are available to download on the official websites. This program created by Byte Technologies and is absolutely legit. However, developers quite actively spread it via questionable software marketing method – bundling. Bundling allows spreading programs as an optional component in software packages. Therefore, if users installed software bundle from a third-party download source (e.g., Cnet or Softonic), this security program may have been installed as well. The purpose of this activity is to promote security software, and hopefully, increase the sales of a paid version. However, many computer users who were surprised by sudden system scans referred to this activity as ByteFence virus. However, we can ensure that this program is not malicious. However, due to suspicious distribution method, security experts assigned this anti-virus to the potentially unwanted programs (PUP) category and highly recommend uninstalling ByteFence from the system. 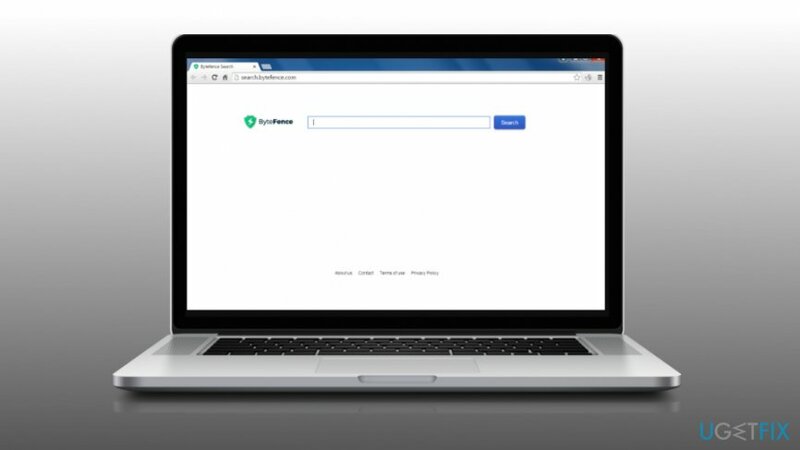 It doesn’t matter whether you installed ByteFence yourself or it arrived bundled, the anti-malware program is capable of setting Search.ByteFence.com as your default search engine which is known as a browser hijacker. When installing software voluntarily, the installer will prompt notification about this browser change. However, if you do not opt out its installation when downloading freeware, these browser modifications might seem a surprise. Therefore, you need to be attentive while installing it and opt out of unwanted installers. However, if you install a third-party tool, such as Java or Adobe Flash updates, additional installers of ByteFence antivirus and Search.ByteFence.com hijacker will probably be hidden under Quick/Basic installation, which is why they will be installed behind your back. Alter system’s settings. ByteFence injects Search.ByteFence.com, which then is set as a default start page and search provider. Additionally, it may install web browser assistant, which may block removal of this search. Search.ByteFence.com may be related to Trojan/Win32.AGeneric file. This third-party search engine may initiate redirects to doubtful websites. It installs cookies and can track people’s web browsing activity. Therefore, if you have installed ByteFence bundled with third-party software, including Search.ByteFence.com hijacker, uninstall it without delay. There are two methods that can be used for ByteFence removal. The majority of security programs detect it as potentially dangerous; thus, you can get rid of it automatically. Additionally, you can uninstall it manually. Many people reported that they cannot uninstall ByteFence using Add/Remove Programs service because the installer is missing from the list. In this case, we would highly recommend you to switch to the Safe Mode (the tutorial given below) and then install software removal tool, such as, Reimage. Run the setup file and set the app to uninstall ByteFence. Although the software will eliminate anti-virus with its registries, you will have to remove Search.ByteFence.com virus and reset each of your web browsers. Once done, reboot the system to save the changes. First of all, press Ctrl + Shift + Esc to open Task Manager. Locate bytefence.exe process and disable it. NOTE: there may be more than one ByteFence related processes. After that, click Start (bottom left corner) – Select Settings – Click System – Apps & Features. Locate ByteFence, click on it and select Uninstall. Click Windows key (bottom left corner) – click the down arrow. 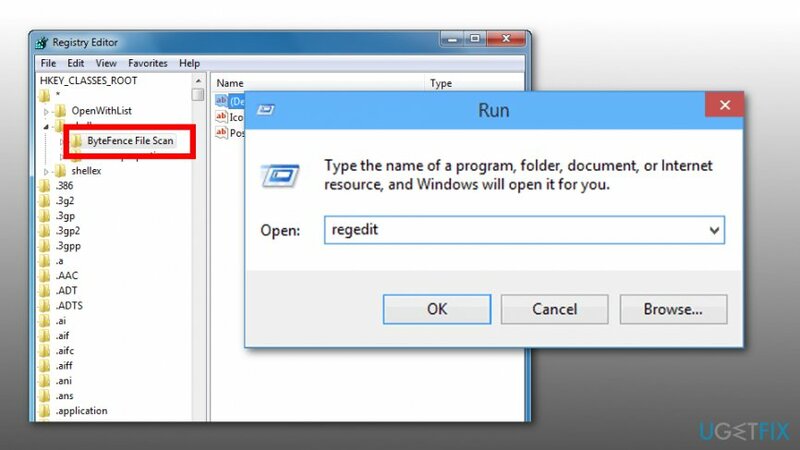 Then press Start or Windows key (depending on the type of OS), type regedit and hit Enter. Finally, delete Search.ByteFence.com plug-in from your web browser and reset its settings to default. ^ Crapware. Computer Hope. The website about computers. ^ Browser hijacker. Malwarebytes blog. Security blog.